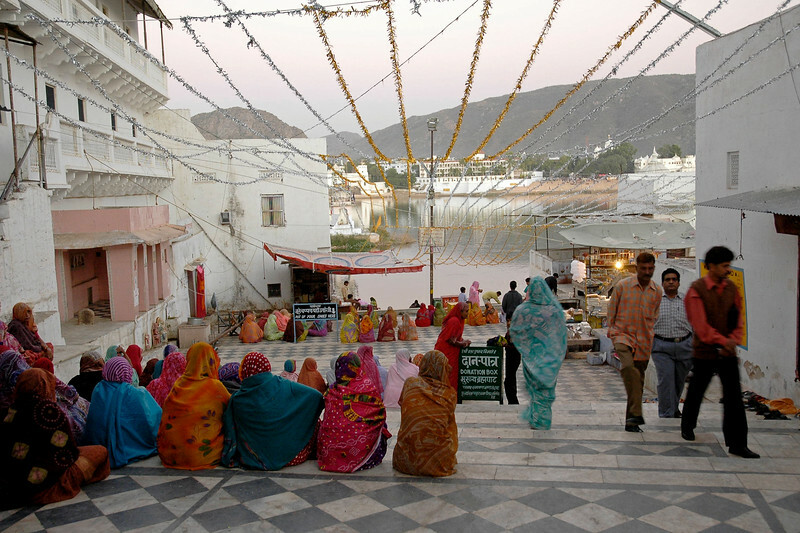 Pushkar (Hindi: पुष्कर), Rajasthan is famous for its Brahma Temple as well as the annual Pushkar Mela. 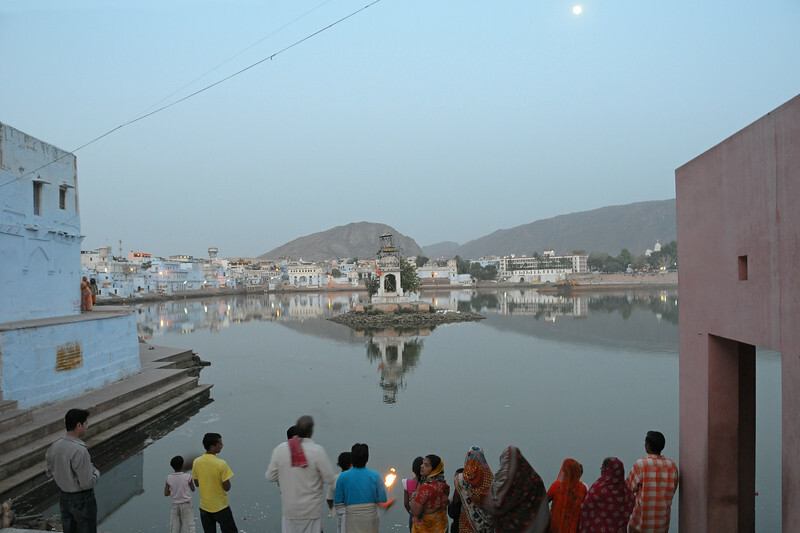 Pushkar situated 11 kms. 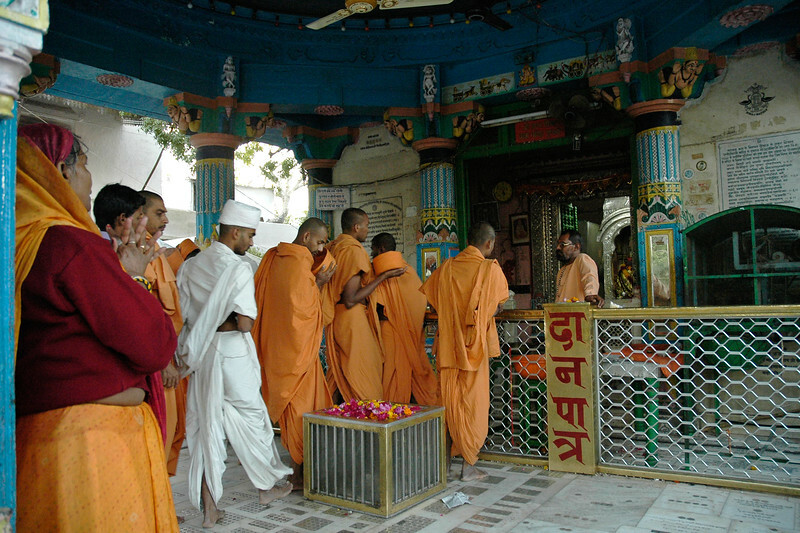 to the North-West of Ajmer is a sacred town for the Hindus. The charm of this sleepy, lakeside settlement so captivated the great Indian poet, Kalidas,that it found a place in his classic, Abhigyan Sakuntalam. The Great Hindu epics of Mahabharat and Ramayana make references to this religious place regarded to be Adi Tiratha. Evidence points to its having existed during the fourth century B.C. lake in the inhospitable surroundings of a desert is no less than a miracle. 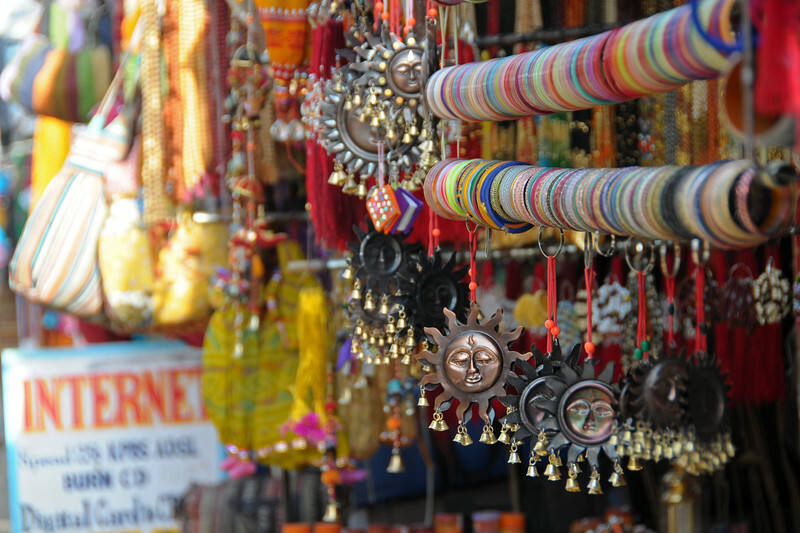 Pushkar comes alive during the mela, but is visited during other times as well. 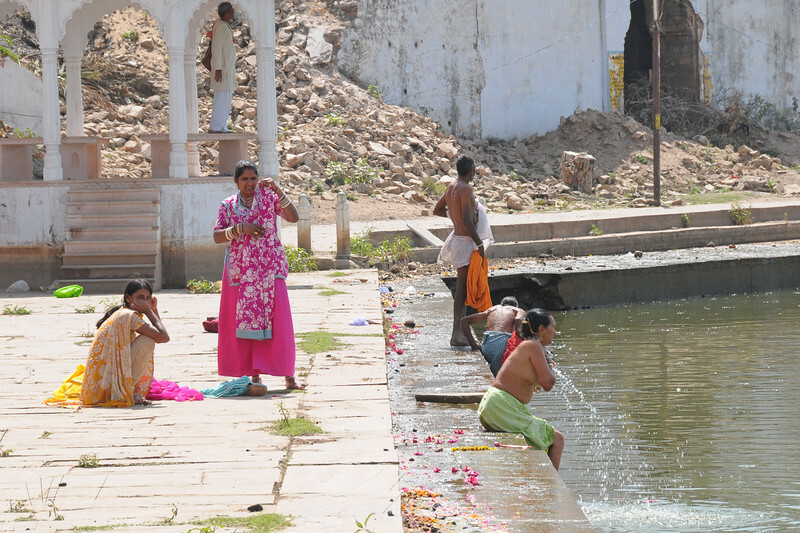 Many Ghats run down to the Holy Lake where pilgrims are constantly bathing in the holy waters. 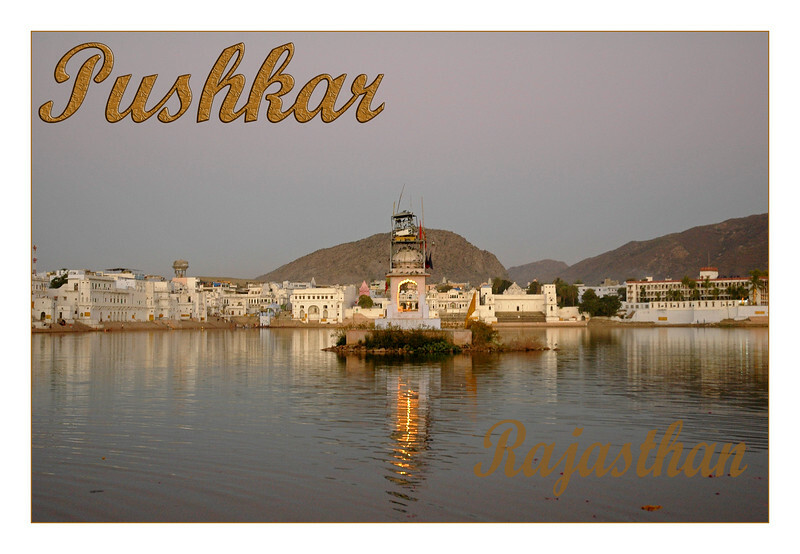 Pushkar (Hindi: पुष्कर) is a town in the Ajmer district in the state of Rajasthan, India. It is situated at 14 km North West from Ajmer. 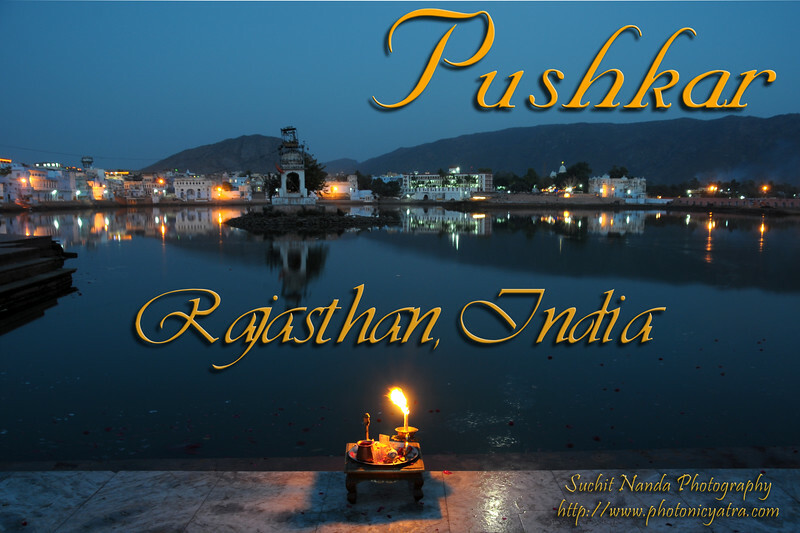 Pushkar is one of the oldest cities of India. The legend associates Lord Brahma with its creation. 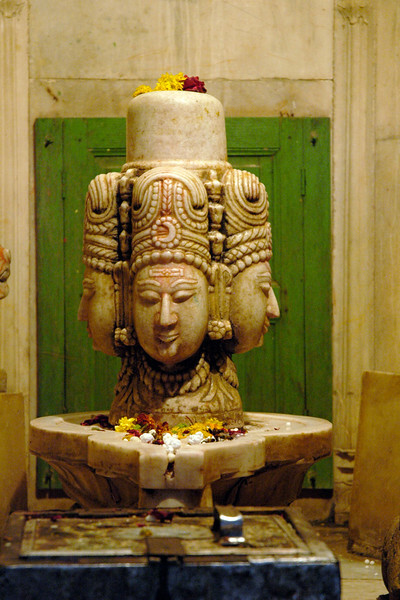 It is mentioned that Brahma performed penance here for 60,000 years to have a glimpse of Vishnu. Pushkar, Rajasthan, India. 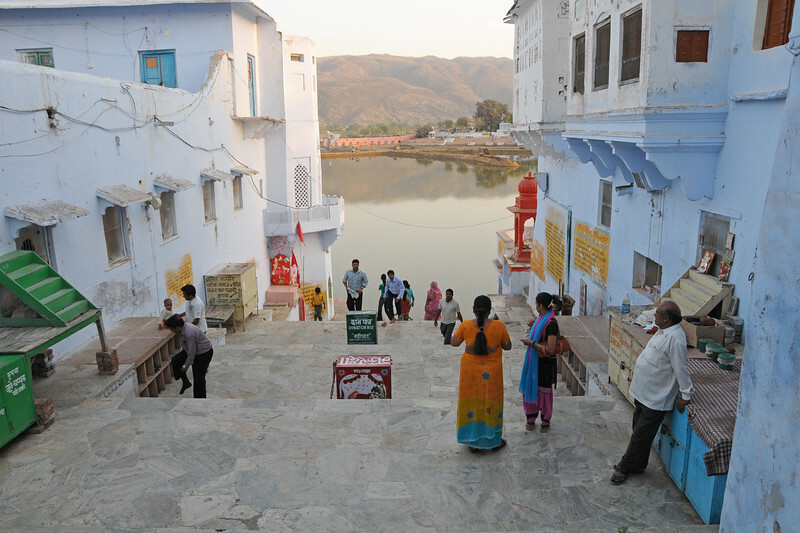 Pushkar is a well-known and important Hindu pilgrim centre. It is just 10 km from Ajmer, Rajasthan. 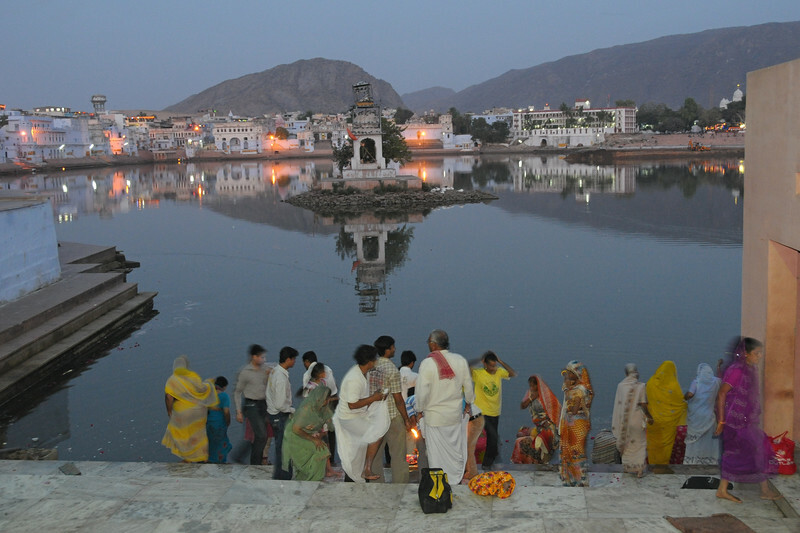 The two important sites are the Pushkar lake and the Brahma temple. 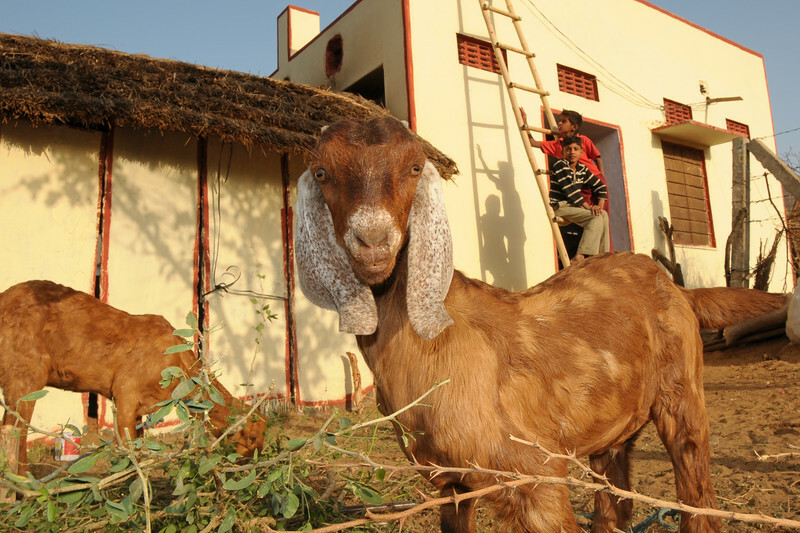 Pushkar is better known and popular for the annual mammoth cattle fair which is an amazing site to witness. 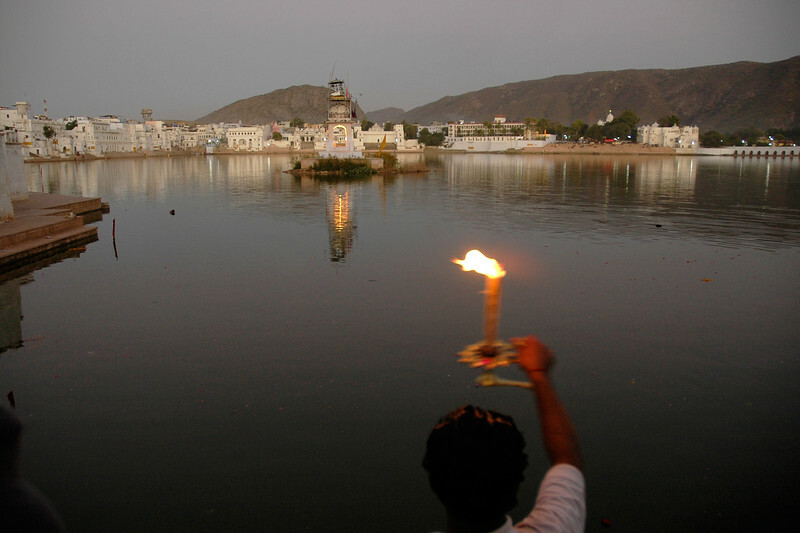 The Pushkar lake is surrounded by hills on three sides and desert on the other side. The cave of Saint Agasthya was located on the snake mountain here. There is one belief that Kalidasa, the Indian counterpart of Shakespeare, had this place as his locale for his Sanskrit drama, Shakuntalam. According to a legend, the lake was formed when Lord Brahma dropped a lotus and wanted to perform a yagna. It has world's only temple of Lord Bramha (God of Creation). 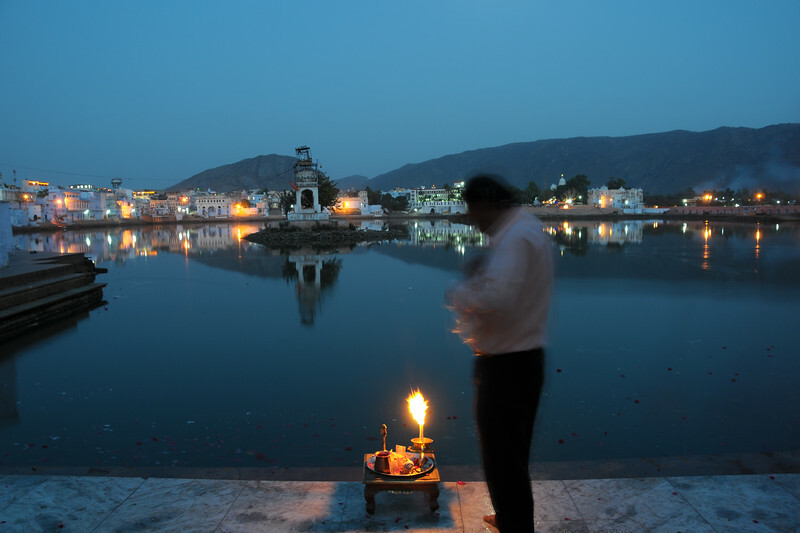 Devote Hindus perform puja at the Pushkar Lake, Rajasthan during the evening aarti. 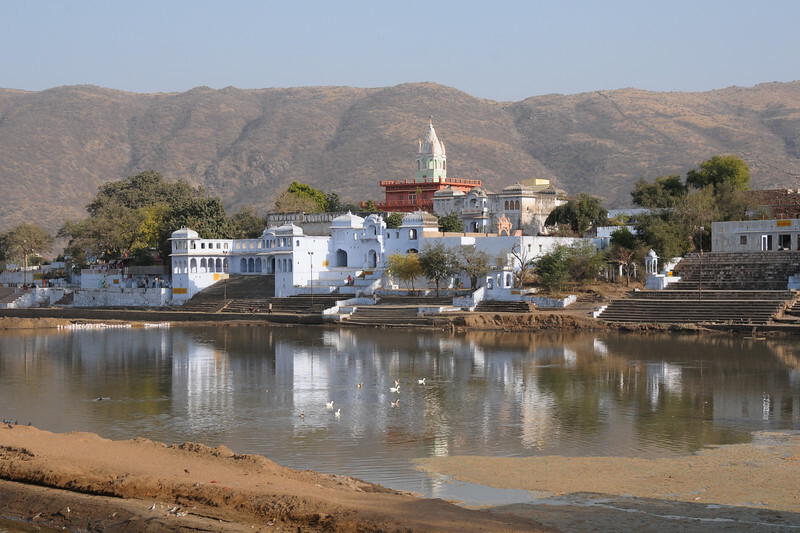 The town of Pushkar is located 14 km North West of Ajmer. 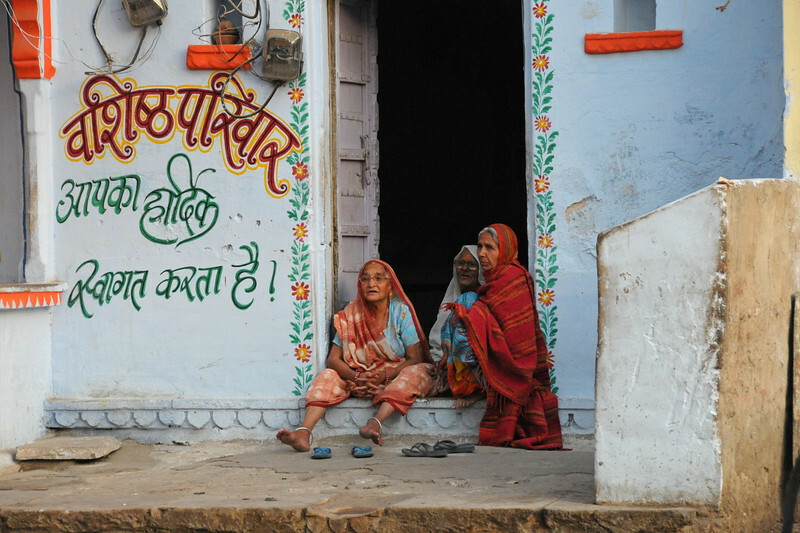 Pushkar is one of the oldest cities of India. It has in recent years become a popular destination for foreign tourists. 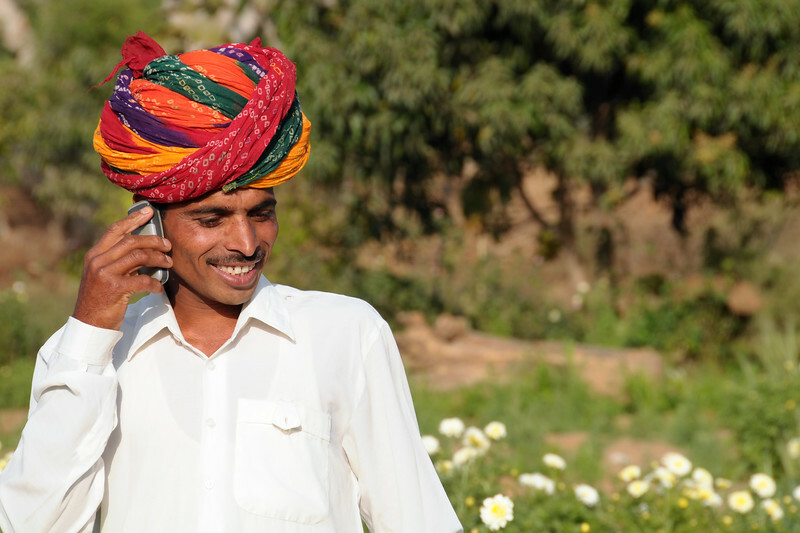 Pushkar, Rajasthan, India. 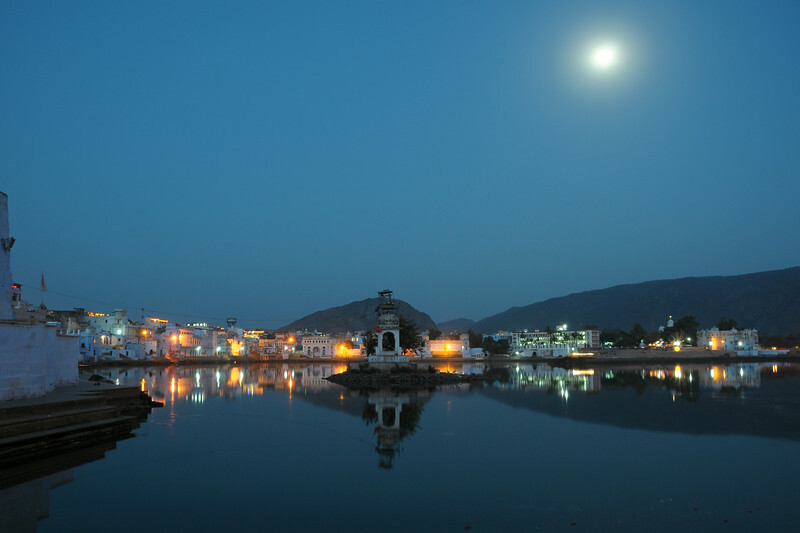 Evening view of Pushkar Lake, Rajasthan with the moon reflecting on the lake. 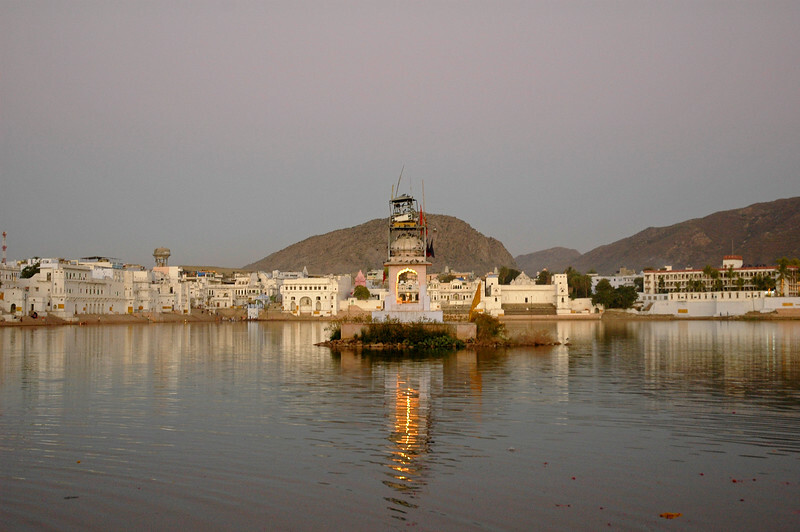 Brahma Temple in Pushkar Lake, Rajasthan. 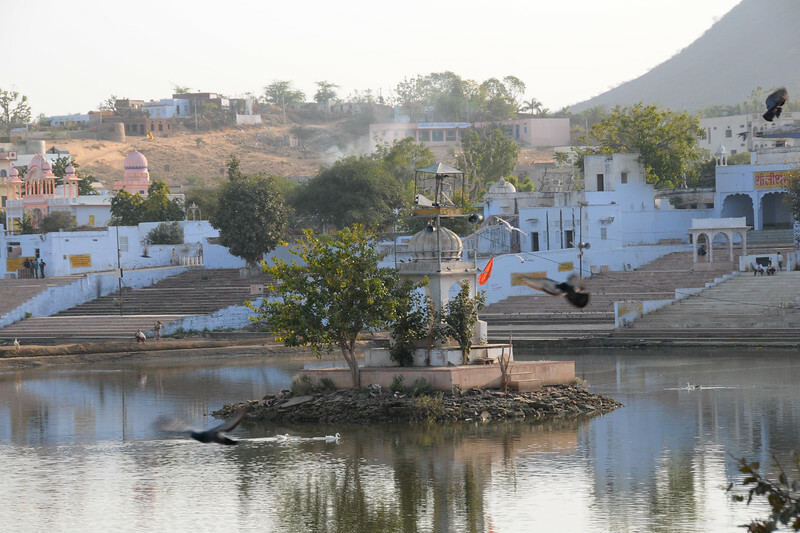 As the free birds fly around, many come to Pushkar to regulate their free mid. For religious purposes and to find peace & spirituality. View of Pushkar Lake from the ghats. 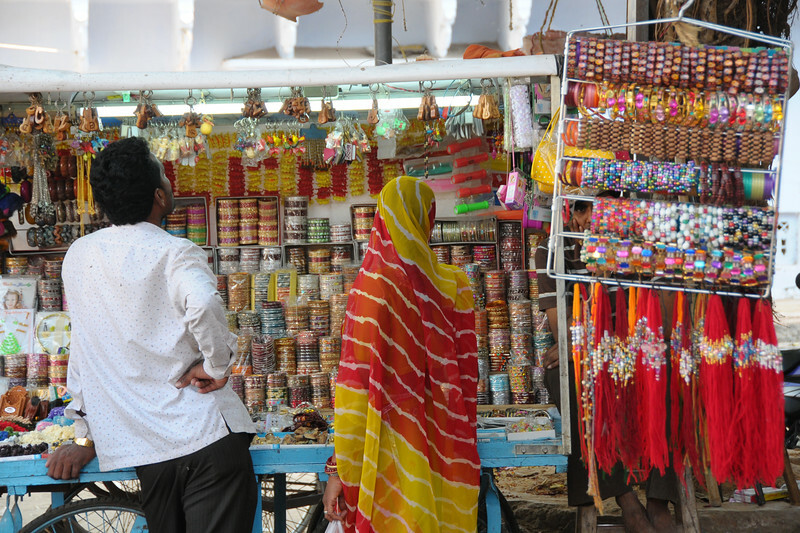 Street shopping in Pushkar, RJ. 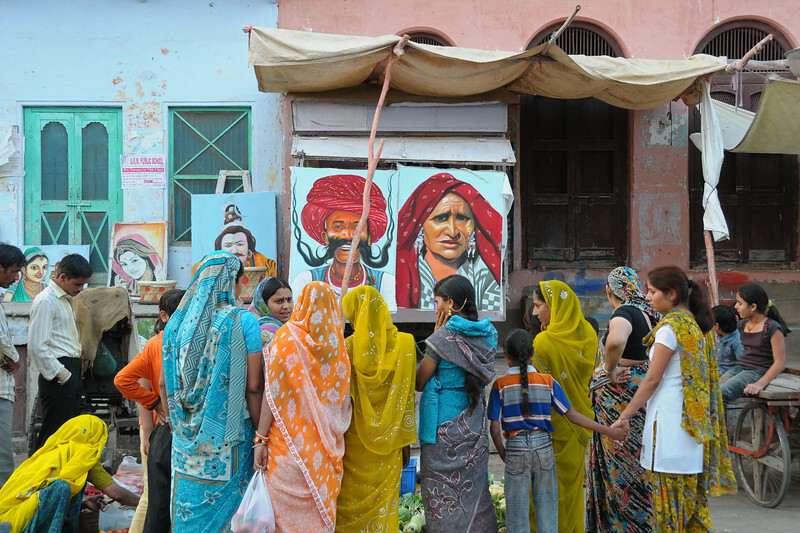 Vegtable shopping in the streets of Pushkar, Rajasthan. If not vegetables, you can buy paintings. Choice is yours. 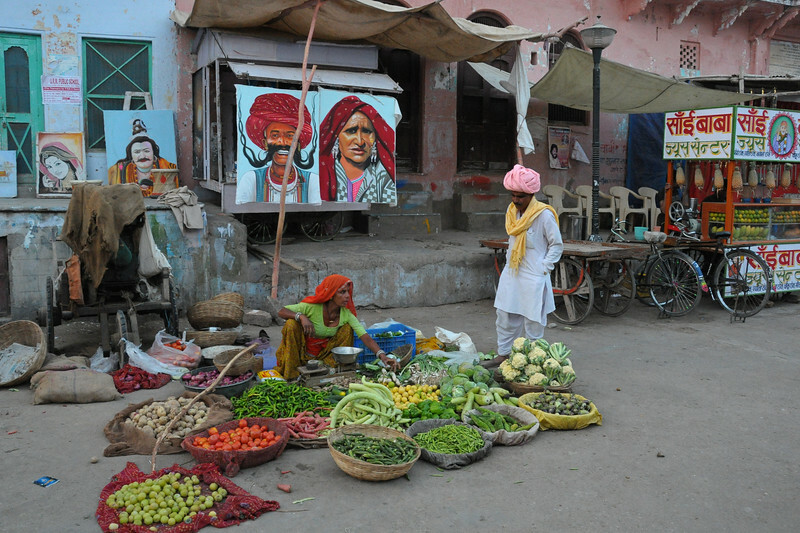 Vegetable vendor on the street of Pushkar, RJ. Vashisht Pariwar apka hardik swagat karte hain (Vashisht family warmly welcomes you). 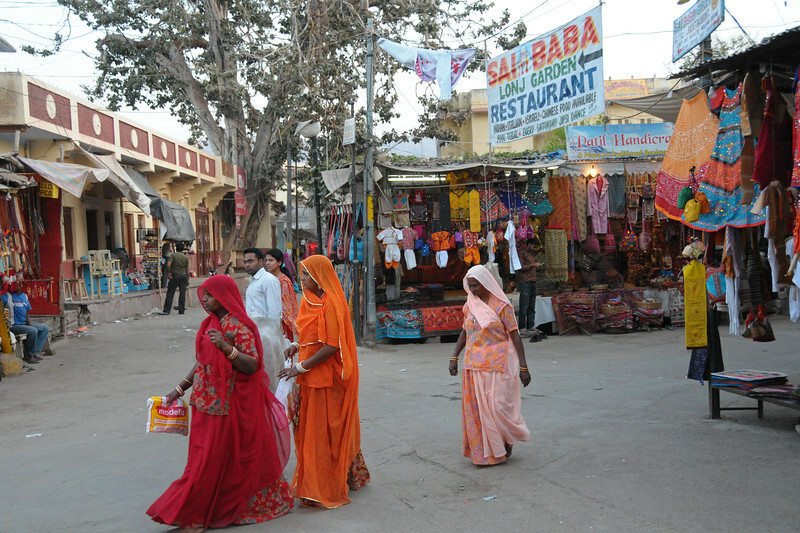 Streets of Pushkar, Rajasthan. 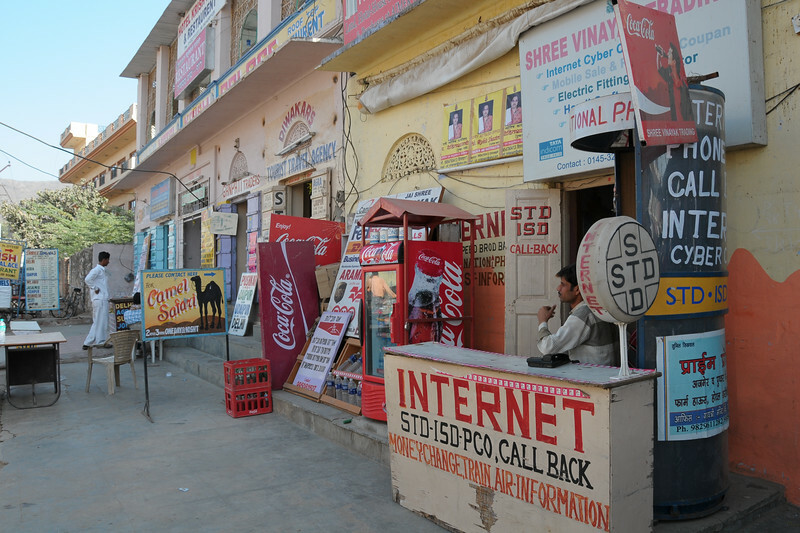 Internet, PCO/FAX and tea/coffee stalls near the Pushkar Bus Stop. Street scenes at Pushark, RJ. View of Pushkar Lake from the ghats. 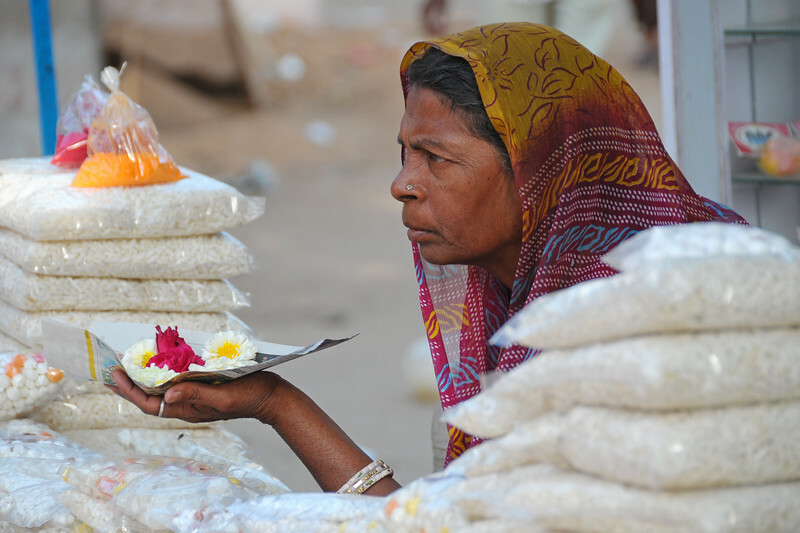 Lady selling flowers for puja (prayers) at Pushkar. Men and women take a dip in the holy Pushkar Lake waters in Rajasthan. The Brahma temple located in Pushkar, Rajasthan is one of the important Hindu pilgrim centre. It is just 10 km from Ajmer, Rajasthan. Monks from the Swami Narayan Sect, visiting the temples in Puskhar. 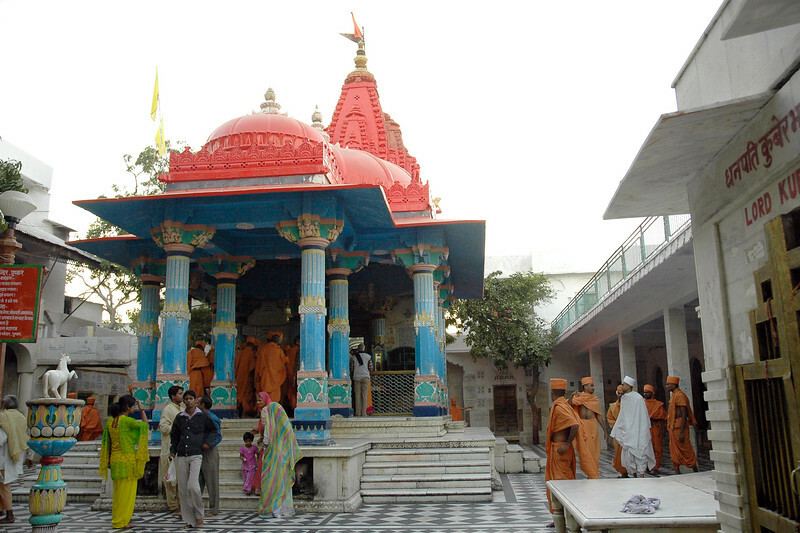 The Brahma temple located in Pushkar, Rajasthan is one of the important Hindu pilgrim centre. It is just 10 km from Ajmer, Rajasthan. 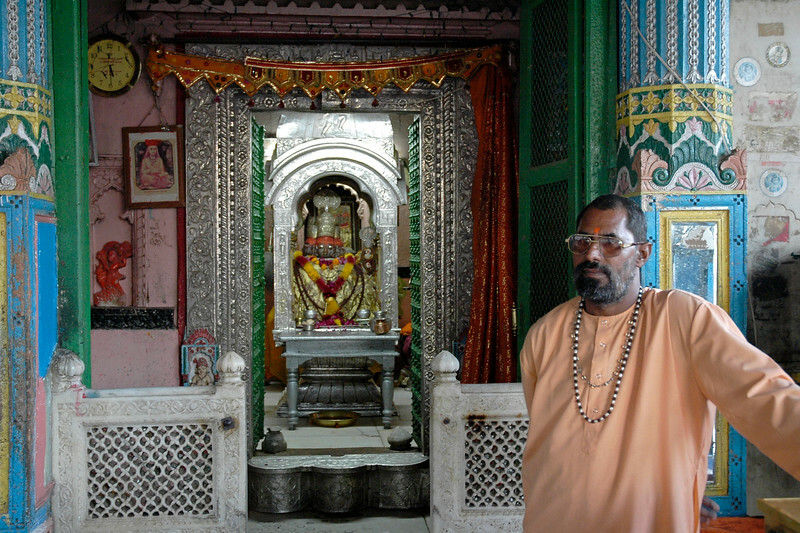 A Hindu priest at the Brahma temple which is located in Pushkar, Rajasthan. This is one of the important Hindu pilgrim centre. It is just 10 km from Ajmer, Rajasthan. 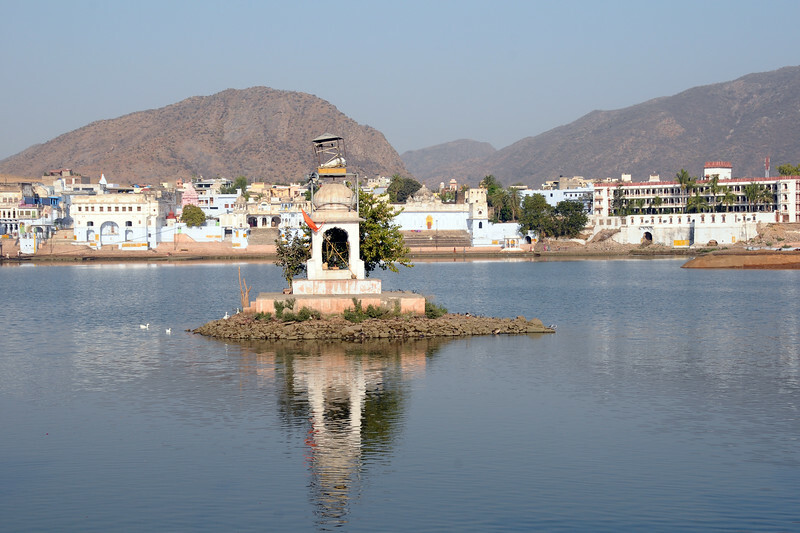 The Pushkar lake is surrounded by hills on three sides and desert on the other side. The cave of Saint Agasthya was located on the snake mountain here. There is one belief that Kalidasa, the Indian counterpart of Shakespeare, had this place as his locale for his Sanskrit drama, Shakuntalam. According to a legend, the lake was formed when Lord Brahma dropped a lotus and wanted to perform a yagna. It has world's only temple of Lord Bramha (God of Creation). The Brahma temple located in Pushkar, Rajasthan is one of the important Hindu pilgrim centre. Ladies assembled on the banks of the lake for the evening aarti. 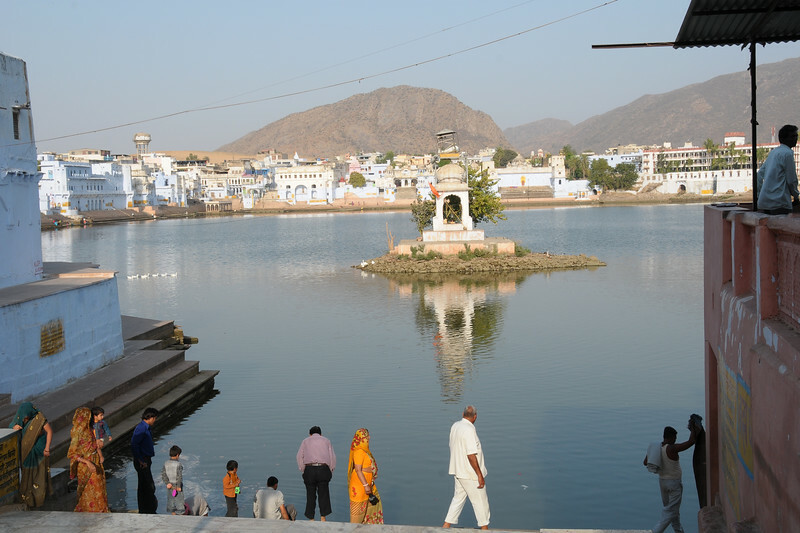 The Pushkar lake is surrounded by hills on three sides and desert on the other side. The cave of Saint Agasthya was located on the snake mountain here. There is one belief that Kalidasa, the Indian counterpart of Shakespeare, had this place as his locale for his Sanskrit drama, Shakuntalam. According to a legend, the lake was formed when Lord Brahma dropped a lotus and wanted to perform a yagna. It has world's only temple of Lord Bramha (God of Creation). The Brahma temple located in Pushkar, Rajasthan is one of the important Hindu pilgrim centre. Evening aarti (pooja) on the banks of the lake. The Pushkar lake is surrounded by hills on three sides and desert on the other side. The cave of Saint Agasthya was located on the snake mountain here. There is one belief that Kalidasa, the Indian counterpart of Shakespeare, had this place as his locale for his Sanskrit drama, Shakuntalam. According to a legend, the lake was formed when Lord Brahma dropped a lotus and wanted to perform a yagna. It has world's only temple of Lord Bramha (God of Creation). 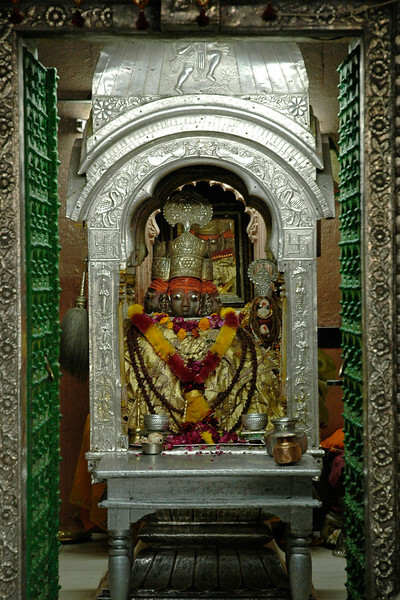 The Brahma temple located in Pushkar, Rajasthan is one of the important Hindu pilgrim centre. 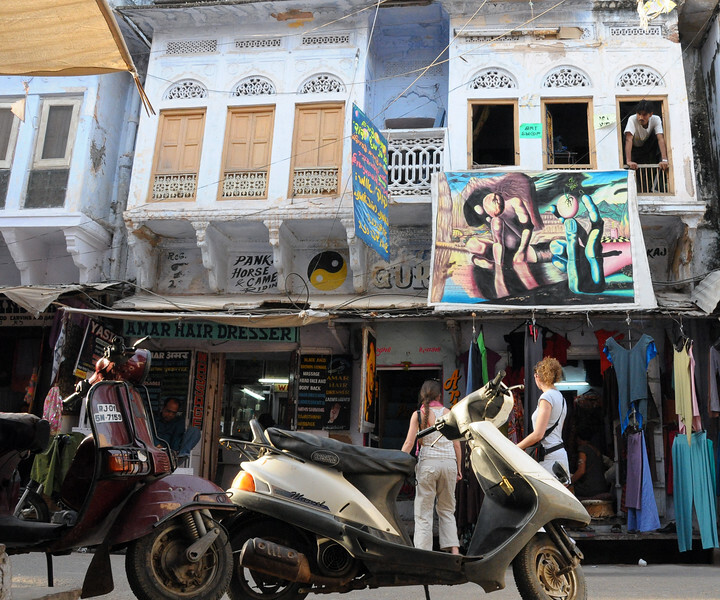 Art Shop in Pushkar cater to the modern tastes and what tourists buy. 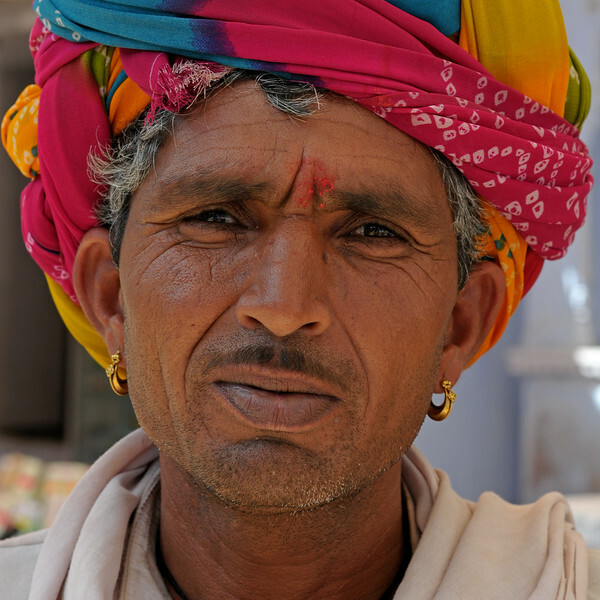 Rajasthani men and women in their traditional attire in Pushkar. 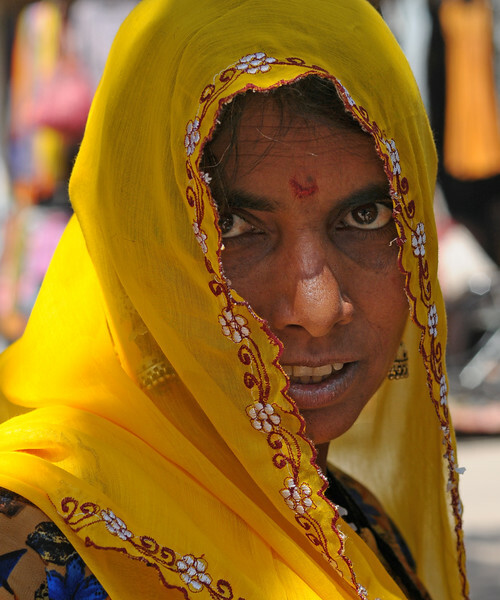 Young lady in Chamunda Matha Road, Pushkar. 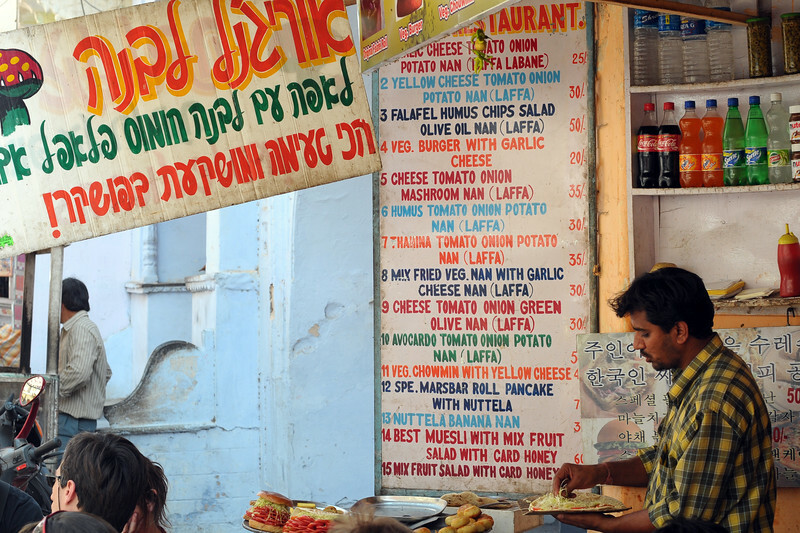 Due to a large presence of Israeli tourists it may seem like Hebrew has become second language in Pushkar, with many sign boards, hoardings and information written in Hebrew. Plenty of food also caters to their tastes. 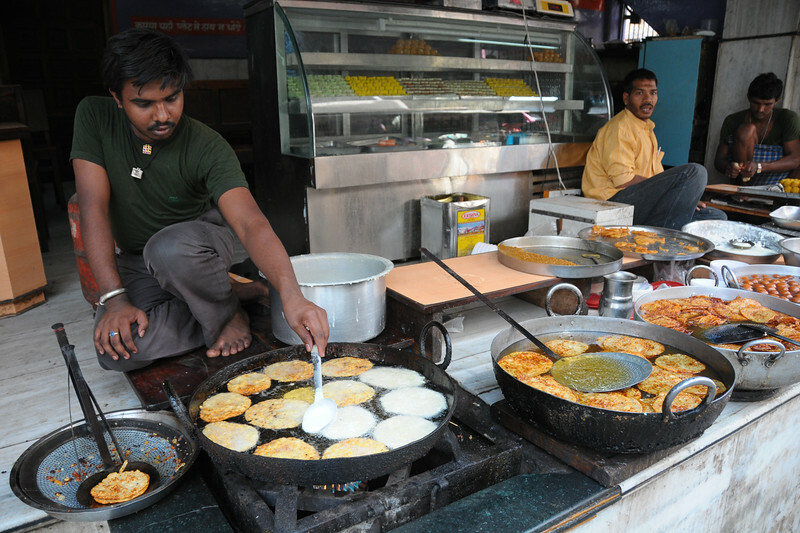 Fresh food being cooked in stalls at Pushkar. Sayar Singh and his wife in Chamunda Matha Road, Pushkar. 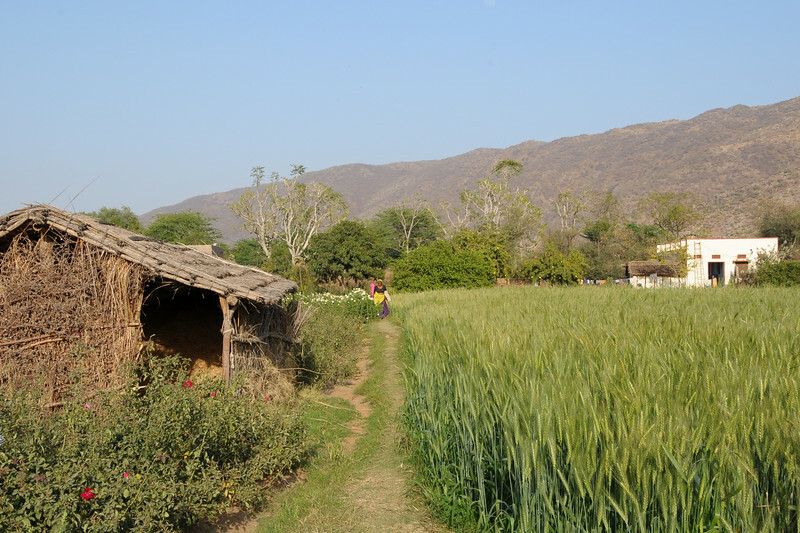 Sayar Singh who is a farmer in his farm land at their home in Chamunda Matha Road, Pushkar. 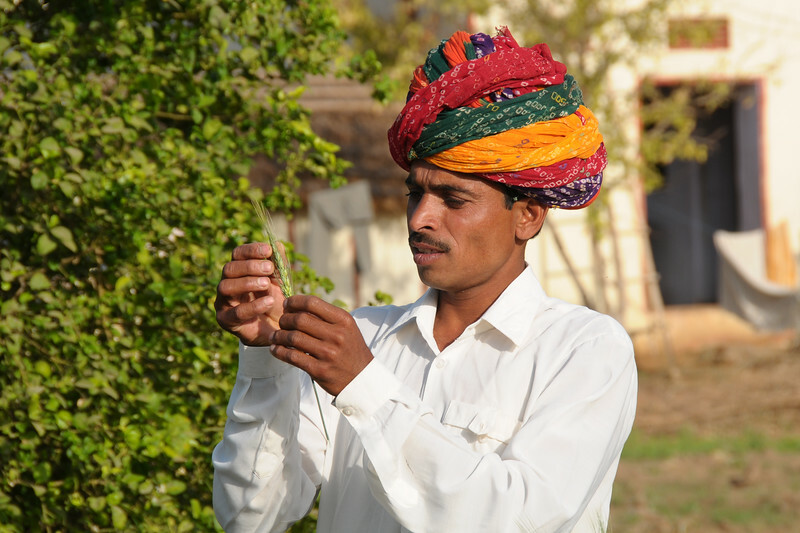 Sayar Singh who is a farmer inspecting his roses in his farm land at their home in Chamunda Matha Road, Pushkar. 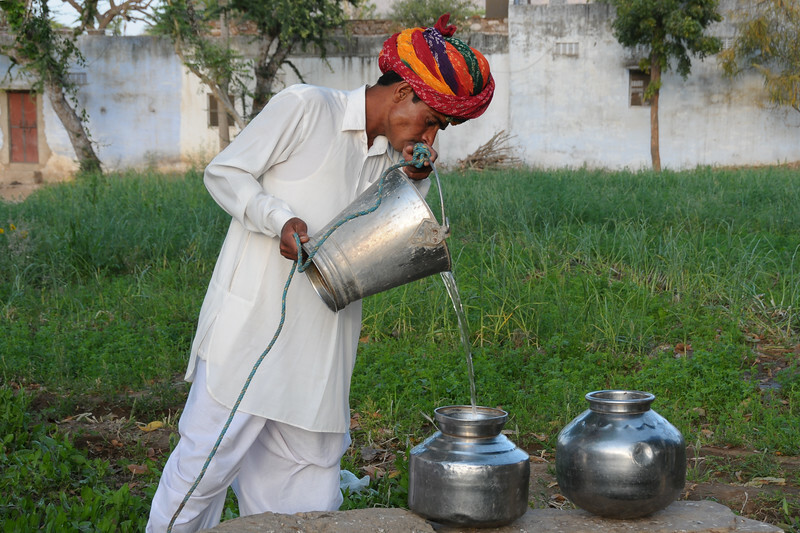 Sayar Singh fetching water from his well in Chamunda Matha Road, Pushkar. 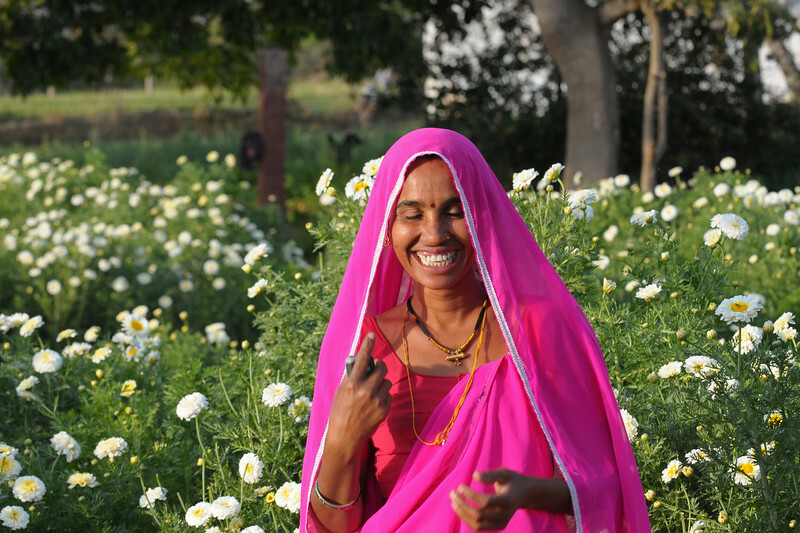 Wife of Sayar Singh at their farm in Chamunda Matha Road, Pushkar. 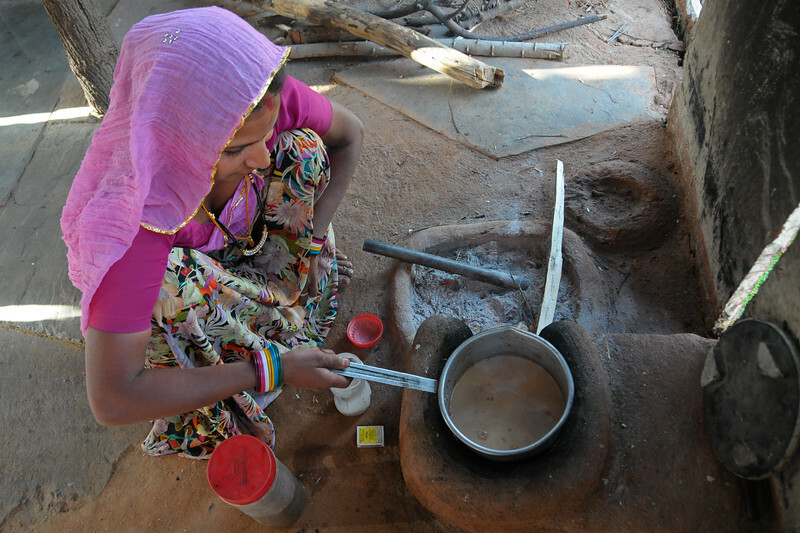 Sayar Singh's sister who was visiting her maternal home making tea at their home in Chamunda Matha Road, Pushkar. Sayar Singh's sister who was visiting her parent's home in Chamunda Matha Road, Pushkar. 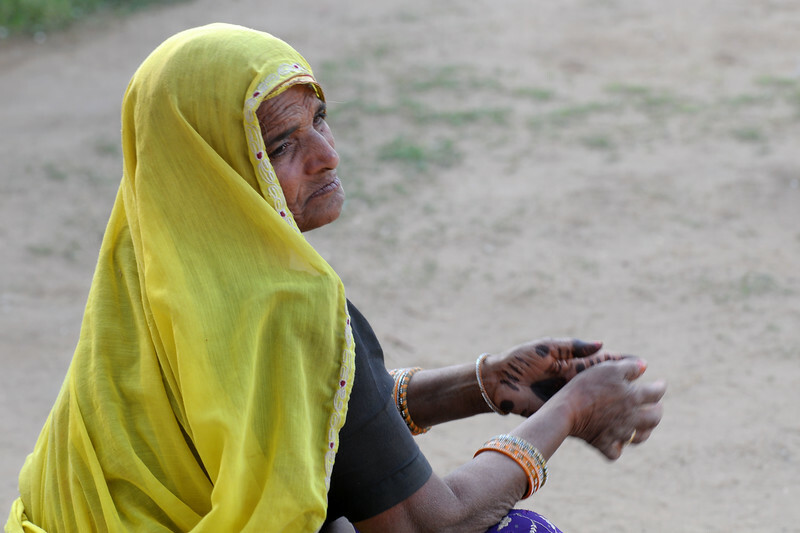 Sayar Singh's mother at home in Chamunda Matha Road, Pushkar. Women doing house hold chores in Chamunda Matha Road, Pushkar. Sayar Singh's home in Chamunda Matha Road, Pushkar. Children at the well Chamunda Matha Road, Pushkar.